It is with a heavy heart that I announce that Windflower Farm‘s CSA season has come to a close. The winter season starts in a couple of weeks, so you can look forward to reports on root vegetables, hard squashes, and dark leafy greens. In preparation for the slow and low cooking that these vegetables imply, I took the opportunity to place one last order for meat from Lewis Waite Farm, which partnered with my CSA for the first time this year. I worked from home this morning so that I could meet an unmarked van full of meat on a street corner near my house. 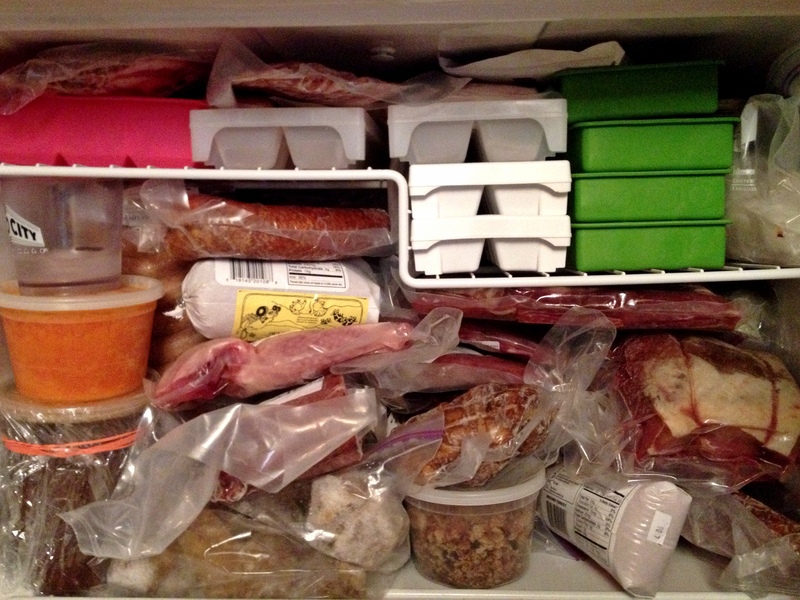 Given that I already had a serious stockpile from my Carnivore Share, I may have gone a bit overboard. I took the afternoon off to catch up on some reading for school. I’m taking Contemporary Issues in Food Studies this semester and spent most of the weekend writing a paper on Taste, Culture and the Production of Cool. This week, we are shifting gears to examine the systems that create and perpetuate global hunger. And so I find myself reading about the impact of The Green Revolution–which increased crop yields but came with a serious consequences in terms of individual health, the environment, economic equality and overall food security–while simmering a large pot of Hoppin’John chock full of whole grains, humane meat, organic legumes and locally-sourced vegetables. Dump the beans into a bowl, add enough water to cover by a few inches, and soak overnight, or for at least six hours. Cover the hock or shank with water in a large dutch oven. Add bay leaves and garlic and cook at a slow boil for one hour. Strain and rinse the black-eyed peas, add them to the pot along with a big pinch of salt and continue your slow boil for another 45-75 minutes until the peas are tender but not mushy. Transfer the pork shank to a cutting board and dispose of the bay leaves. Dump the peas into a bowl, put your pot back over medium heat and add the olive oil. Add your leeks and peppers. Stir occasionally while the vegetables soften, adding thyme after a few minutes. Meanwhile, pull the meat off of the pork bones, chop it up, and add it back to the pot. Add a cup of long-grain brown rice, plenty of freshly ground pepper, two cups of the bean liquid, and two cups of water. Taste the broth and add salt if needed. Bring to a boil, then lower the heat, put a lid on it, and simmer for 40 minutes or until your rice is tender. Mix in the parsley and the black-eyed peas, along with enough of their cooking liquid to give the dish a loose consistency. Add more salt and pepper as needed. I like to round out the flavor with a couple of tablespoons of vinegar. 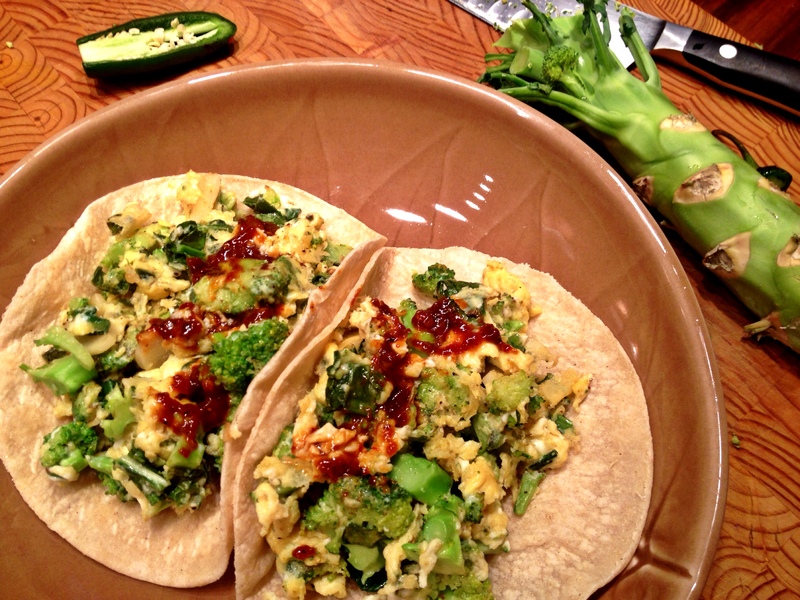 If your peppers aren’t as spicy as you might have liked, you can also use a vinegar-based hot sauce to get that tang. 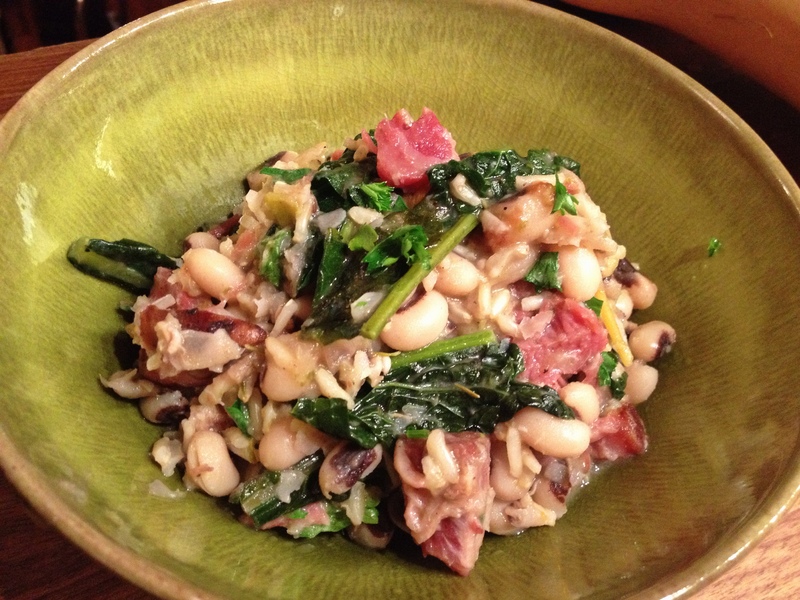 For a little Hoppin’ John history, another tasty recipe featuring black-eyed peas and greens, and a glimpse at my Dollywood pilgrimage, check out A Hoppin’ New Year. Sometimes just making it to Friday night seems like a Herculean feat. I came home bruised, battered, and hungry. While I had just about made my way through the Homemade Hummus from last weekend’s chickpea extravaganza, I still had a pint and a half of whole chickpeas left to consume. Today was bitterly cold and I found myself craving something warm and spicy. Bring the oil up to medium heat in a medium-sized heavy-bottom pot. Add the onion and sauté stirring frequently. After a few minutes, add the ginger and jalapeño. Meanwhile, toast the cumin, coriander, fenugreek and peppercorns in a dry cast iron skillet, shaking frequently, until they begin to pop and release their smell. Grind these using a mortar and pestle or an electric grinder. Add the garlic to your onion mixture. Stir constantly for about one minute. Then add your ground toasted spices plus the turmeric and garam masala and continue stirring for one minute, allowing the spices to hydrate in the oil. Add the chickpeas with their liquid, the tamarind, the sugar and a nice pinch of salt. (There is probably some dentist-approved way to handle the tamarind, but I just tore it into small pieces with my hands and then fished out whatever seeds I could spot as the fruit disintegrated into the sauce. I recommend doing a better job than I did, though I managed to avert a trip to Dr. Czarnik.) Bring to a boil and then reduce the heat and let simmer for a while, adding water as needed. This is a good time to put some rice on. (While basmati would be traditional, I used some brown Jasmine rice, because that’s what I had, and added turmeric and salt.) When your rice is just about done, taste your chickpeas and adjust the seasoning with salt and sugar as needed. 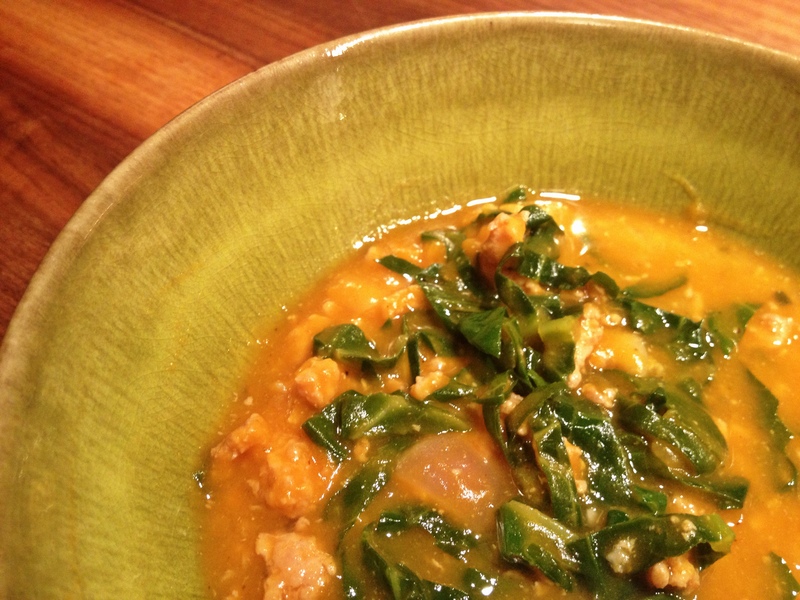 Then add the spinach in batches, stirring to speed the wilting process, and cook until the leaves are just tender. 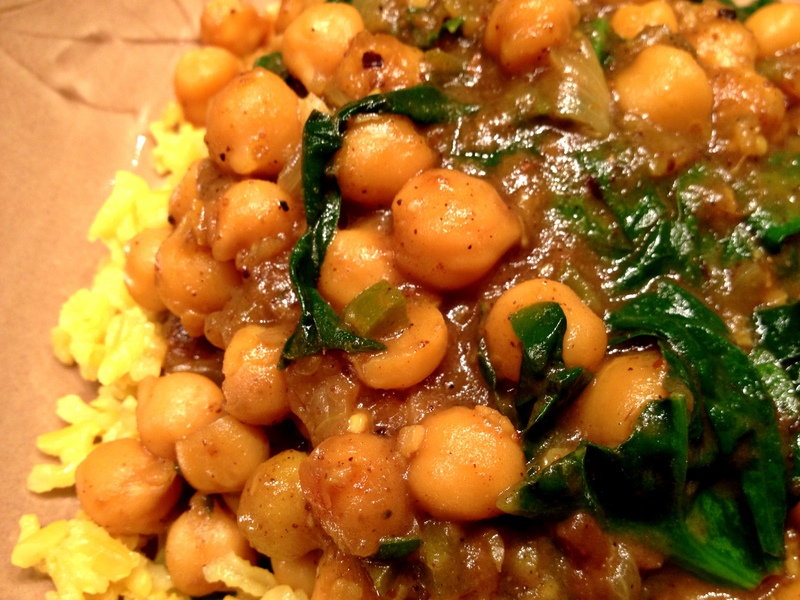 The resulting meal was a delightful mashup of my favorite Indian takeout dishes. But, with no dairy and just a tablespoon of oil for about four servings, it was much lighter–which is a good thing when you need to buckle down and write a paper at the end of a very long week. As previously reported, I spent six months studying in Jerusalem while in college. This was back in my vegetarian days, and Israel is a great place to be a vegetarian. While the majority of the Jewish population is secular, kosher tradition holds, meaning that most restaurants are either meat or dairy. On top of that, Middle Eastern food embraces legumes and vegetables. Being the child of hippies, I’d already consumed a lifetime worth of chickpeas. But the hummus in Israel was a revelation–creamy, rich and flavorful–and I indulged with abandon. This came with a price; back in the States, I couldn’t bring myself to eat the lazily mashed canned chickpeas that my college cafeteria tried to pass off as hummus. Even in New York City, where I eventually settled, truly delicious hummus proved elusive. At some point, hummus started popping up in Korean delis and the fancier cheese sections of grocery stores. I tested them all. Some were as bad as the salad bar glop of my coed days. Some were serviceable. But none were inspirational and, after a tub or two, I always reverted to making my own. About ten years ago, by sheer accident, I found it: hummus like I remembered. It was a tiny shop just south of Washington Square Park and up half a flight of stairs. A couple of weeks later, over drinks, I announced to my buddy Alex that I had discovered Jerusalem-quality hummus right in the middle of Greenwich Village. Alex interrupted me to announce that he had, in fact, recently found the best hummus in New York City in the East Village. Already a couple of drinks into the evening, we proceeded to argue for the superiority of our individual hummus spots for what must have seemed an eternity to the people seated around us. It turns out that we were arguing over the same hummus. Ori Apple, an Israeli who bemoaned the lack of good hummus in New York City, had opened the first two locations of Hummus Place just months apart. I am happy to report that, since then, a number of good hummus restaurants have opened around the city. But I still enjoy making my own. While I don’t really have a fixed recipe, I have learned a few things over the past 20 years. First, and this is truly important, don’t use canned chickpeas. The texture and flavor will be off. Trust. Second, use good quality tahini. (I suspect that this may be the secret to Hummus Place’s magical concoction.) Third, use plenty of liquid. Finally, let the food processor run for longer than you think reasonable. Here’s what I whipped up this afternoon, but feel free to make it your own. So long as you cook the chickpeas enough, it’s honestly hard to screw up hummus. Just keep tasting and tweaking. In the morning–or whenever you are good and ready for a little procrastination–drain and rinse the beans. Add them to a large pot, top with plenty of water, toss in the peeled garlic and the red pepper flakes. Bring to a boil and then reduce to a simmer. Let this go for an hour or so while you get back to whatever duties you have been shirking. Test the chickpeas. If they are tender, add a tablespoon or so of salt and then let them simmer for another 15 minutes. The water should taste fairly salty. Realize that you are in danger of making a truly obscene amount of hummus. Scoop half of the chickpeas and some of the liquid out. Refrigerate or freeze for future use (in a soup, stir-fry, curry, etc.). 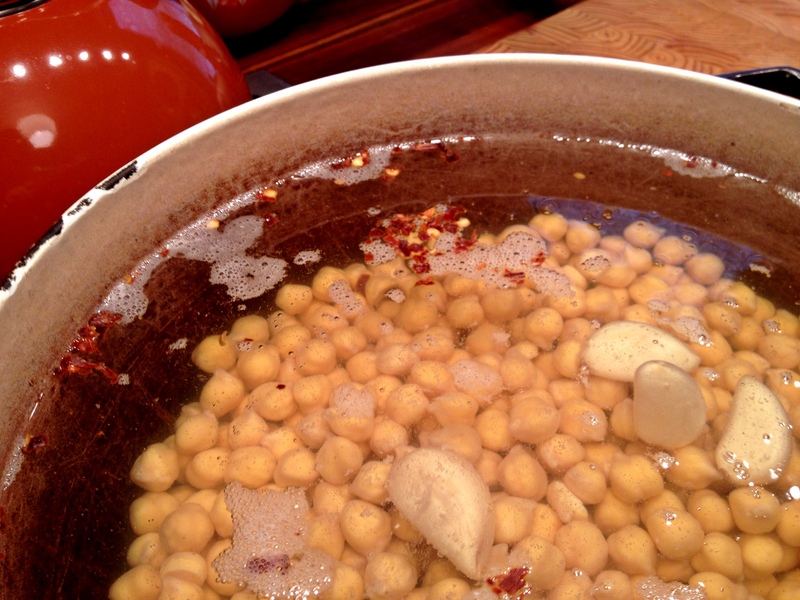 Dump the cooked garlic and the remaining chickpeas into your food processor, making sure to reserve the cooking liquid. Add the tahini, sweet and hot paprika, lemon juice, sumac (if you have some), plenty of black pepper, and whatever else your heart desires. Pour about half a cup of the cooking liquid in and process away. Let it run for five minutes or so, adding more liquid as needed to achieve a loose but not soupy consistency. Taste and adjust seasoning as desired. 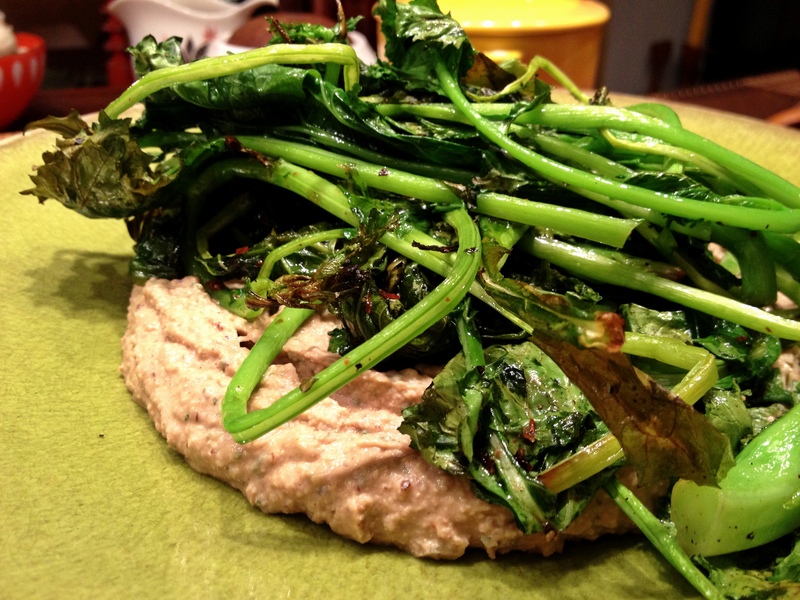 I ate this for dinner tonight, topped with a tangle of roasted broccoli rabe. Good stuff.